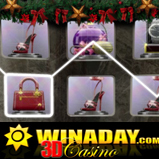 In the midst of the biggest shopping season of the year, WinADay.com 3D casino has launched a new slot machine dedicated to the dedicated shopper. The new Reel De Luxe is a 5 reel, 25 payline slot machine with a luxurious shopping theme, wild symbols, 2 special bonus features and a bonus game. Like all the great shopping centers of the world, the Reel De Luxe is decked out in holiday decorations this month. The Reel De Luxe is the seventh one-of-a-kind, instant-play casino slot game at the three-dimensional casino, alongside 3 unique video poker games. Reel De Luxe is easy to play and with its “Present Bonus” feature, which awards up to 500x the bet, it can payout enough to fund a pretty extravagant shopping trip. There’s also a special Cash Bonus Game with prizes up to $1500 and for shoppers that look for the best deals around there’s a “Discount Bonus” - a discount from total bets on 3 spins up to 100%. WinADay is an instant play Flash casino so there is nothing to download or install before enjoying the games. The new Monday Madness casino bonus adds 10% to deposits made on Mondays. Like all of the slots games at WinADay.com, the new Reel De Luxe is tied to the WinADay progressive jackpot which, after a recent $200K win, is already back up to nearly $80,000. This video clip has more on that win: http://www.youtube.com/watch?v=ZDSUdjrbfMc.